Useful link. Searched for this after a question raised in a training session. I’ve experienced this problem quite a few times. Email router stops working for no apparent reason. When you test the email router you get a warning message saying “Email Router Service is not Started”. You also see this error message in the event view. “The E-mail Router service could not run the service main background thread. The E-mail Router service cannot continue and will now shut down. Looking around on the web I found quite a few solutions including advise to remove and re-install the Email router. I found this KB that finally helped me resolve the issue. 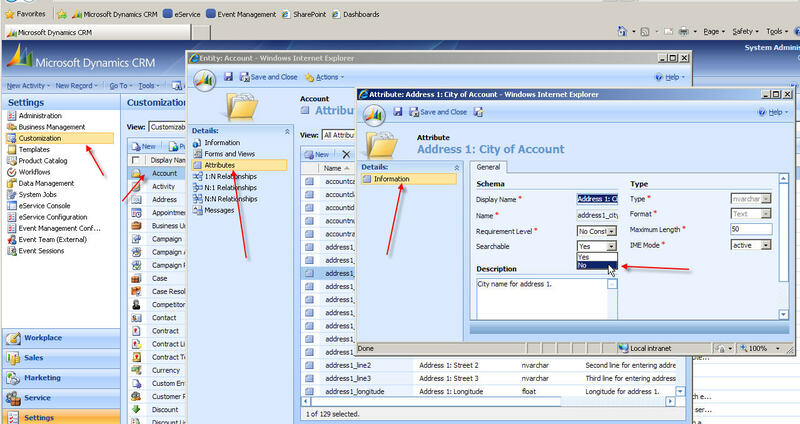 This article provides a concise description regarding availability of Microsoft Dynamics CRM extensibility features across the three types of deployments. A new user group that provides an online platform for experienced users, consultants and developers to share their knowledge about the Microsoft Dynamics CRM platform and associated technologies. To participate in events all you need is a computer and an internet connection. I recently saw this question posted on the MS CRM Forum and I can clearly understand why this would be a requirement. When you look at fields using an advanced find you get a list of all attributes associated with the entity. This sometimes can be confusing for end users. In the screen shot below you can see a list of all fields associated with the account record type. To remove fields not used on the form you will need to set the Searchable field to No on the attribute customization form. To do this you will navigate to the Settings area, click customizations, click the attributes tab and then click on the attribute you want to remove from the list. You will then need to set the searchable field to No. The screen shot below demonstrates how do do this. You will then need to publish your changes. Once the changes have been implemented the non searchable field will not be visible in the Advanced Find field list. Be advised that making a field non searchable will also make the field not visible in the report wizard. Mobile Express for Microsoft Dynamics CRM 4.0 is available for download. Microsoft announces 3 new accelerators. You can read more about these at the link below. Microsoft CRM of course does not allow you to assign a system user to multiple sales territories. There is a simple work around though. This solution might help you overcome this constraint. Simply create a new sales territory that is a contains both territories . Add the user to the new territory. 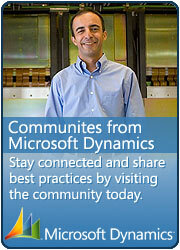 Update Rollup 5 for Microsoft Dynamics CRM 4.0 (KB 970141) released. Delete active quotes using workflows! I was recently asked about how to delete an active quotation. You might need to delete quotes if you have created quote during system demonstration or testing and would now like to delete the quotes rather than just deactivate them. Of course if you try to delete an active quote you get an error message stating that it is read only. An unsupported way would be to update the quote statuscode and statecode in the QuoteBase table. But you can also do the same by creating a workflow that updates the status of the quote. To create the workflow have a look at the image below. Make sure that your workflow is set to run on demand. Once you’ve created the workflow go back to the quotation grid and you will now get the Run workflow button. 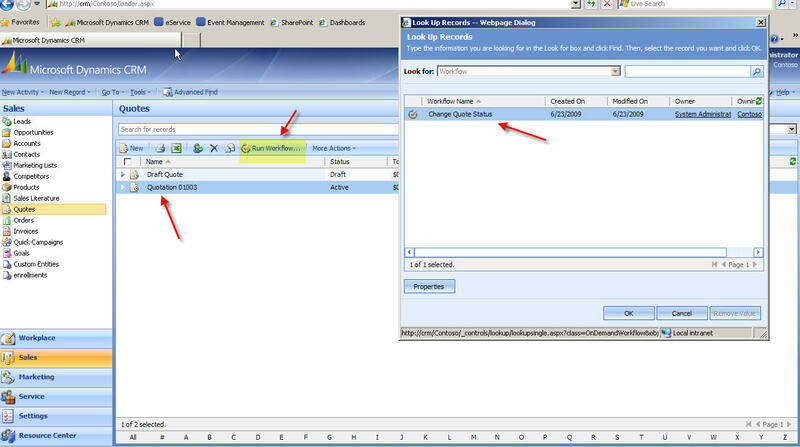 (This button is not visible if there is no “run on demand” work flows against the record type). Click the button and run the workflow that you’ve just created. When the workflow completes the quote status will be set to draft and you will now be able to delete the quote.